India has a rich culture of using beautiful beasts on the roads and in 2017 Hyundai launched their own beast which is made India and has some awesome features in it. 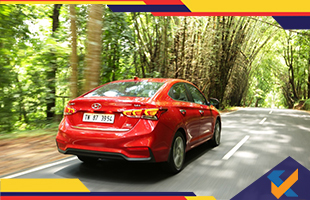 Hyundai Verna is the name of this car which made an impact not only in India but also in some other countries also which is a mind blowing achievement for the car company. The Middle East countries are especially very much interested about this particular new generation Hyundai Verna car. It has a rich look and if you see this beast on the road then automatically you will fall in love because of its beauty. Hyundai is also offering some beautiful features in this car and one of the main feature is that the sporty look of the car. Maybe you have heard this quotation that the first impression is the last impression and this beast can kill you with its beauty. The interior of this new generation Hyundai Verna is beautiful and a sporty black cabin is present. The seats are completely covered with leathers and the steering is completely leather protected and if you are the driver then you can get all the features of the car in front of you. This car offers the riders some classy technical support in the car like inside the car it contains a touchscreen infotainment system and you can connect it with both apple and android operating system with the help of Apple CarPlay and Android Auto. You can start the car easily just by pushing the start button and there are many exciting features are present like Hill Assist Control. The main operation of this control system is when the car is at idle state and if the surface is not plane then there is a high possibility that the car will roll down and to prevent that the hill assist control is introduced. In the car ABS, ESC and rear camera with powerful sensors are present. In the Middle East country like Bahrain has shown the most interest in this new generation Hyundai Verna car. As it is selling in Bahrain also for that reason the company has to make the car and they have to shift the steering from the right side to the left side as the left side is used in those countries. From the Chennai plant the Hyundai Verna is exported for Bahrain and this beast is available in two modes and i.e., 1.4litre MPI petrol and 1.6litre MPI petrol engines. Power figures and most of the other stuffs remains same as the Indian version. The gearbox is also six speed automatic gear. From a survey it has been seen that the front look of the car is beautiful with bi-function projector headlights. If there are fogs everywhere then do not worry so much because the fog lamp enclosure is present in the car. Recently the company is trying to start their exporting business in Australia and they are hopeful about their success.